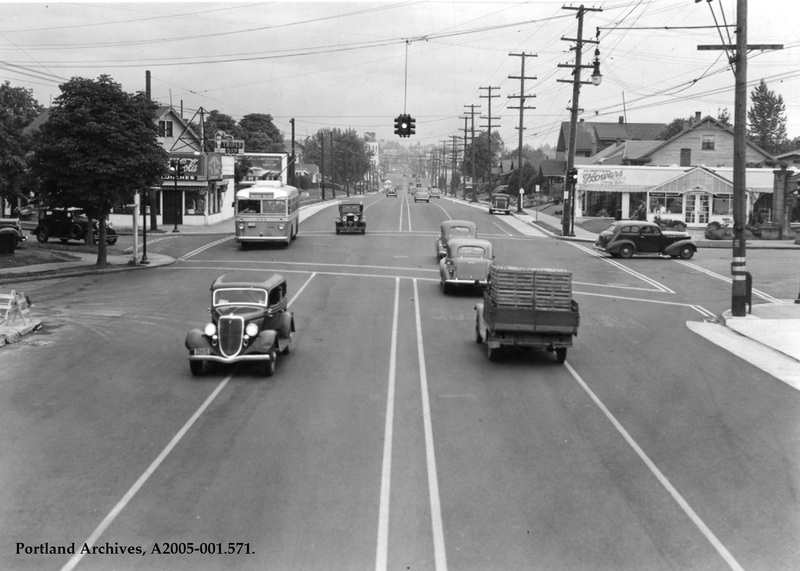 NE Sandy Boulevard at NE 33rd Avenue looking northeast, circa 1940. City of Portland (OR) Archives, A2005-001.571. Kind of hard to make out but I think that’s Flowers Tommy Luke there on the right. Triple Dip building is still there, as is the big house on the left with the skinny, shed roof dormer. I wonder how much a ‘triple dip’ cost in 1940. The old traffic signal looks like a work of art. Nice selection of autos. I think that’s a ’34 Ford front and center and probably a late ’30s Chevy heading to the right. Could be a Model A next to the bus. Any help or corrections? So is one of the dips in Sandy ahead about where the Banfield went thru? You can see this intersection come to life from he wonderful footage on U tube. Hoping someone who ,knows how to post the link. I don’t. Typing in; Dan Haneckow. There’s a variety of clips but the one Im referring to is the- Sandy Blvd at 28th 1939. Which also shows 33rd. Witness the insane traffic control of the time. Mike has it right. Tommy Luke had 4 locations in 1945, 33rd & Sandy, SW 6th & Alder, W Burnside & 23rd, and North Portland Rd. near Vanport. Mikey the building in the distance was Pabco Paint for a short time before the iconic 7 up sign. This was build in 1926 and was a giant milk bottle for the Stegerwald Dairy plant at NE 37th & Sandy. Pabco reshaped it to look like 2 paint cans. ya think the car on the right might have run a yellow light…? Great video, Craig. So, if the dates are accurate, the cables for the trolley busses were added between ’39 and ’40. At the far right, you can see a Laurelhurst gate, which is now long-gone. It’s pair on the other side of Peerless Place (not visible) still stands as a lonely beacon to short-sightedness. That video is scary awesome! Well, one thing seems clear from the video that Craig posted: Driving along NE Sandy in those days was much more hazardous. I can’t believe how many drivers pulled out in front of oncoming traffic. And then there’s the guy who pulls right out in front of the motorcyclist! Craig, thanks for that video! It’s a trip back in time; you really feel you are there. A little before my time, but I certainly remember the trolley buses on Sandy when I was a little kid. Also Hollywood Theater Saturday afternoon matinees before TV, the wonderful 7-Up bottle building, Tic-Tok Drive-In, and the impressive-looking House of Prime Rib set back a ways from Sandy. I remember an “S&H” green stamps at that location. Also that Mexican restaurant down the street a little. Poncho’s maybe? I can’t remember. I would have thought everyone on here would have known about those old driving videos by now. They’ve been on line for years. The link below is to a photo I found a few years ago on Dead Memories Portland. In the photo you’ll see the intersection of NE 33rd and Sandy looking north, circa 1965. Gas was 31 cents a gallon at the Chevron (where Jiffy Lube is now) and you could take your S&H stamps to the redemption center on the right. Isn’t it curious how the first five comments today (all before 7:20 a.m.) were from people named some version of Michael? Interesting! things where much better then nicer buildings cheap gas stuff was better made to and classy homes !!! Gasoline @ $0.31 would now be $2.53 in today’s dollars. Current price of gas in Portland is ~$3.13. Fleet average mpg in 1965 was ~15. Now it’s ~30. Even assuming you don’t have a plug in electric vehicle we are spending far less to get around now than in 1965. Patrick: Excellent points. I drove thru Laurelhurst yesterday and the vast amount of trees and overgrowth make it impossible to see the streetscapes, it’s all hidden. The pictures when Laurelhurst was without all the camouflage are much more desirable. Also saw mass numbers of cheap high rise apartments along Burnside and Sandy Blvd. They’re already eyesores and not even completed yet. Really sad what’s happening. My great grandfather owned a service station at 3351 NE Sandy that must have been built just after this (Portlandmaps has it as 1940). Great photo!